The Apocalypse Gen 2 RDA by Armageddon MFG is the second iteration of the Apocolypse RDA with some nice improvements. The clamp design has a massive 13mm space in each clamp which provides space for mounting the most complex & insane coil builds. Coupled with the 4mm deep juice well, 21mm build deck, durable post clamps and extended post screws, the Apocalypse is a builders dream. 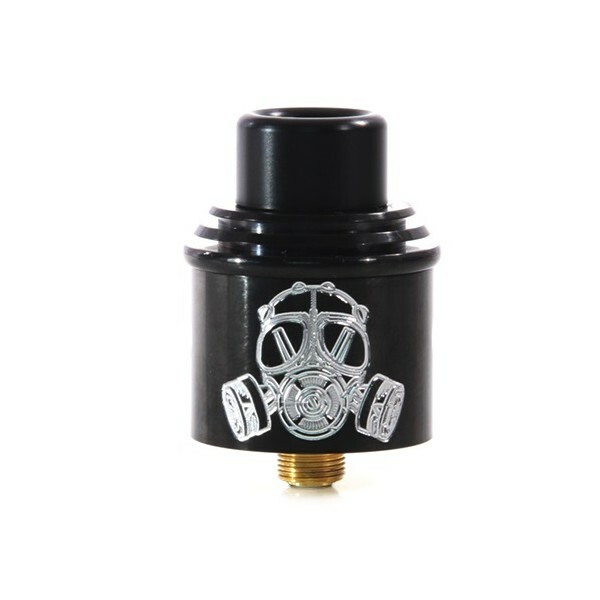 The unique teardrop shape air flow control provides extra customisation and the sleeve has the “APOCALYPSE” logo engraved into one side and the Gas Mask Logo etched on the opposite side. All Apocalypse Gen 2 RDA’s have individual serial numbers engraved in to the base and the RDA is available in 6 finishes; Stainless Steel, Black, Brass, Copper, Heat Treated and Gold. The Apocalypse Gen 2 is also compatible with Dirstict F5ve’s Chubby Summit & Kupcake top caps. The drip tip fitting is not quite compatible with most Kennedy/Goon Compatible tips but a bit gentle of DIY to the tip can make it work. The Apocalypse Gen 2 RDA by Armageddon MFG comes in an embroidered felt pouch boxed with spare O-Rings and post screws. Rebuildable atomizers and unregulated devices are strictly to be used by experienced vapers ONLY that have sufficient knowledge and experience in safe coil building, Ohm’s Law and battery safety. Please ensure care is taken as to not cause damage or harm to the atomizer, vaping device, or yourself. Beaum Vape is not responsible for the safe use of this product and will not held responsible for any harm or damage caused as a result of using this product.